A few different versions exist, all with generally the same artwork. The Japanese version is the same minus the title change, but features an entirely different front cover. "Welcome to theland of the ancient Aztecs, where money talks and enemies an be bought. 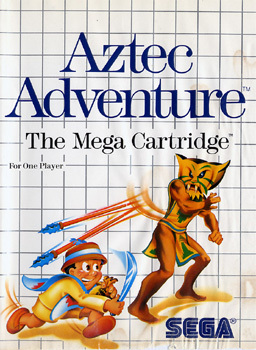 Your objective: reach the Aztec Paradise, where the tokens of wealth and happiness await." 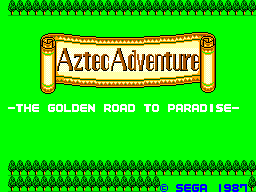 When the "Aztec Adventure" scroll is closed on the title screen press Up on the Directional Pad 5 times. Then, while Nino throws money, press Right 3 times. When he heads to the left press Left once and then Down once. Press start. Before the game begins, you will see Nino and his three pals on the screen. 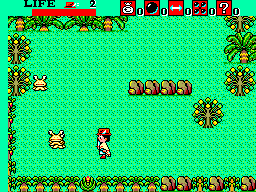 Quickly press Left on the Directional Pad, then press Right 20 times. If it worked, you will see a little Nino character on the right with a number below him that you can change to play different sounds. 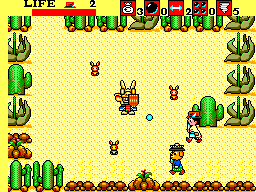 Japanese commercial showing Nazca '88, as well as Penguin Land.